I own not only the Yamaha HTR-5280 Natural Sound 5 channel receiver but also a step or two upwards in model in a Pioneer receiver and a Denon as well. In comparison the Denon for example offers no bass & treble manual adjustments nor anything else that allows you to do anything short of wondering how their unit can be returned. I am using it now with an equalizer otherwise it would be worthless to me. I love my older model Pioneer as it is super powerful and the first theater model I have owned. The Pioneer is the worst as for frequency output. Even with manual access to bass & treble it is still not able to be adjusted to sound good on it’s own and cumulatively it’s a piece of junk. My big question here is why? Don’t these big-time manufacturers have the ability to listen to what they are producing before marketing? Mind you I could design speakers that are perfectly matched to either of my lesser receivers but again why? Nearly no one has the ability I have so again why didn’t they setup these systems with varying speaker packages and find a setting that best accommodated most of them and hey what if they were adjustable to accommodate anything hooked up to them. No such luck here until I finally found and bought one of my life long dreams come true in a nice good quality Yamaha home receiver in the 5280. This receiver is most versatile in ability and puts all others under the table as for sounding good no matter how or what i connect to it as for components and/or speakers. 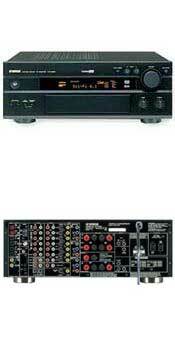 I am about to buy my second Yamaha HTR-5760 Receiver. Why you may ask yourself would a guy if he’s telling the truth that already has three high power amplifiers be looking into buying a fourth large high power 7 channel receiver? Because I used to think linearly. One amp was enough for anyone and what you have is what you are locked into working with. Not anymore for me. I have speakers that can handle all seven channels within two cabinets and I have quite a few others that are able to consume as many channels as I can grasp to fill the room with the fullest rich sounding audio one could ever hope for and the ability to fine tune is over the top when you don’t close your mind to working with only one receiver. Believe it or not my Denon receiver will be given to one of my children and the Pioneer is used for the kids TV and video games. Only the Yamaha receivers will be used where I listen to audio both video and music. Mind you I haven’t mentioned a word regarding anything specific I appreciate about this receiver. For this review I have chosen to only speak of whole news. Whether to own one of these or not to begin with. If you make the mistakes I have in buying any of the lower brand names such as Denon or Pioneer you will forever be comparing them to the best in Yamaha and if you never own a Yamaha natural Sound Receiver you will never know how good audio can sound for too as well. if that isn’t enough for you than I suggest you follow my example and find out the hard and expensive way how to accumulate equipment that simply dies in comparison to the Natural Sound of Yamaha. PS: For the record: I don’t work for Yamaha. I’m not filthy rich. The last two receivers I have bought I bought one through Craigâ€™s list here in Portland, OR and the other I bought through E-Bay. The Pioneer I paid a small fortune for directly through a department store that specializes in high end audio equipment.. Thanks for your ear, Tony ….